I know it’s technically fall now. I see the apples at the market. I see the squash. I’m not impervious to the presence of root vegetables. I recognize the glorification of fall in every mention of a pumpkin-based coffee drink. But here’s the thing–I’m not quite ready to give up on summer just yet. I am still enjoying sun golds, even if their flavor has dulled these past few weeks, if I can find them at all. And so this ice cream pie is my compromise, my concession. It includes basically all of the prime fall flavors: apple cider, maple syrup, nutmeg, cinnamon, toasty nuts, and deep vanilla. But, it’s ice cream. It’s a total mess in all the best possible ways, and calls to be eaten right away. Believe it or not, I intended to prepare a simple recipe this week, but then, I am kitchen-insane so that didn’t work out. If all this seems like way too much, simplify: buy caramel from the store–stir in a little vanilla extract and fall spice. Buy the ice cream–your favorite brand of vanilla might work best. I know this is a project recipe. Maybe take it on in parts–everything is fall-tastic and delicious on its own anyway. 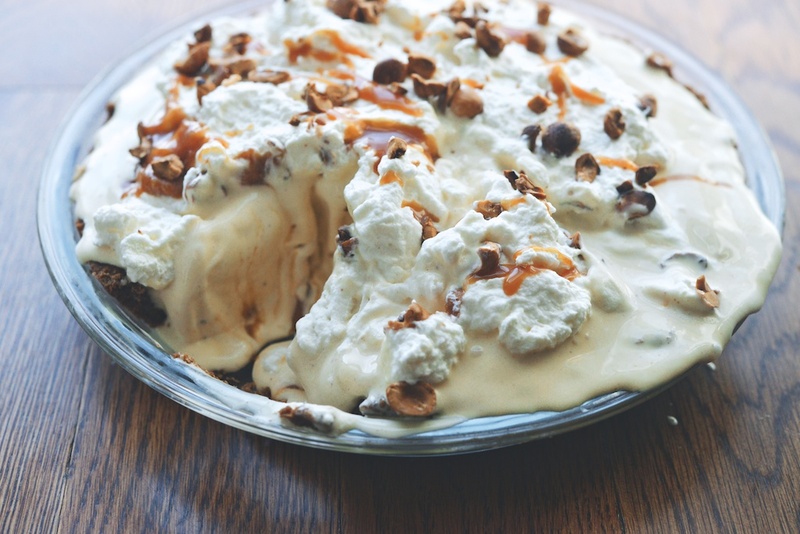 You could make the caramel, whipped cream, and chopped nuts, and serve them alongside ice cream for fall ice cream sundaes. Or, graham crackers + fall-flavored ice cream for ice cream sandwiches. Reduce the apple cider, adding a clove to the mix, and spoon it over vanilla ice cream, yogurt, or oatmeal. Try the crust with pumpkin pie, for a twist on the traditional. To make your life easier: the caramel can be made up to 3 days ahead and refrigerated. The custard base can be made up to 2 days ahead and refrigerated. 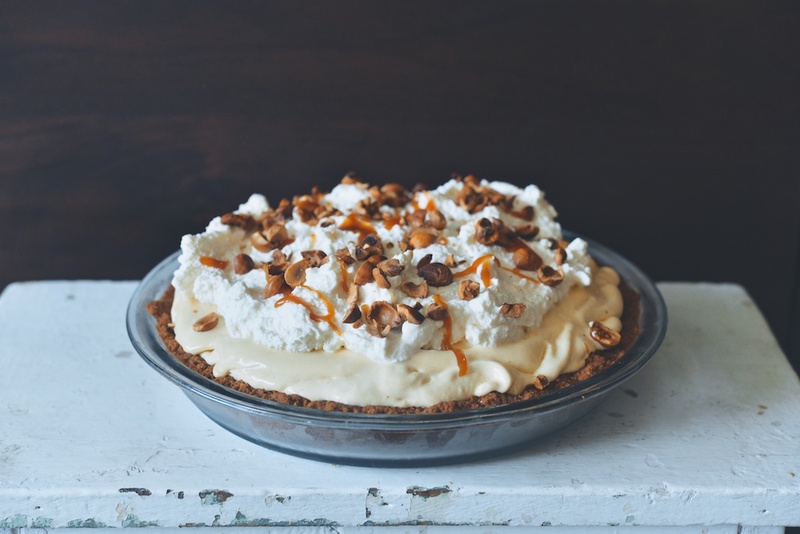 The whipped cream and the hazelnuts can be prepared up to 1 day ahead; refrigerate the whipped cream. 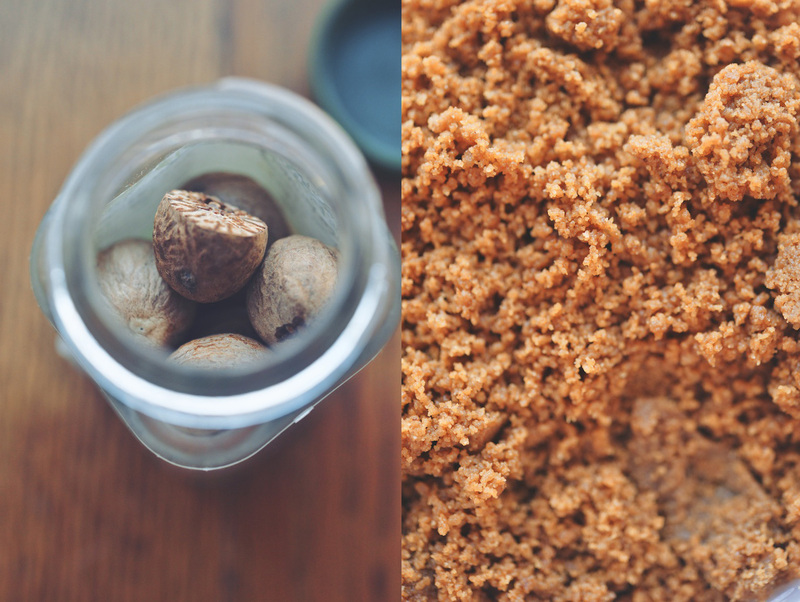 The graham cracker crumbs can be pulverized 1 day ahead; store them in an airtight container. For this recipe, I used homemade graham crackers from Brooklyn Larder, which taste a whole lot like Biscoff Cookies, which I imagine would also work very well in this recipe. My pie was inspired by a photo of The First Mess’s Banana Split Ice Cream Pie. My caramel (quantities and method) came from Melissa Clark at the New York Times. Make the caramel: Pour the sugar into a medium-sized saucepan, making sure to distribute it evenly across the bottom of the pan. Turn the heat to medium. Watching carefully, allow the sugar to melt. (Resist the urge to stir the sugar! You can swirl the pot, however.) Wait until the sugar is melted, and then turns amber–this will happen rather quickly, so pay attention. Turn off the heat. Carefully, pour the cream into the pan. (The contents of the pot will foam and make a big fuss, don’t worry about it.) Allow the cream about 30 seconds to settle down, and then turn the heat back on, this time to medium-low. Now you can stir the contents of the pot, to blend the caramel into the cream. Add the salt and the vanilla extract. 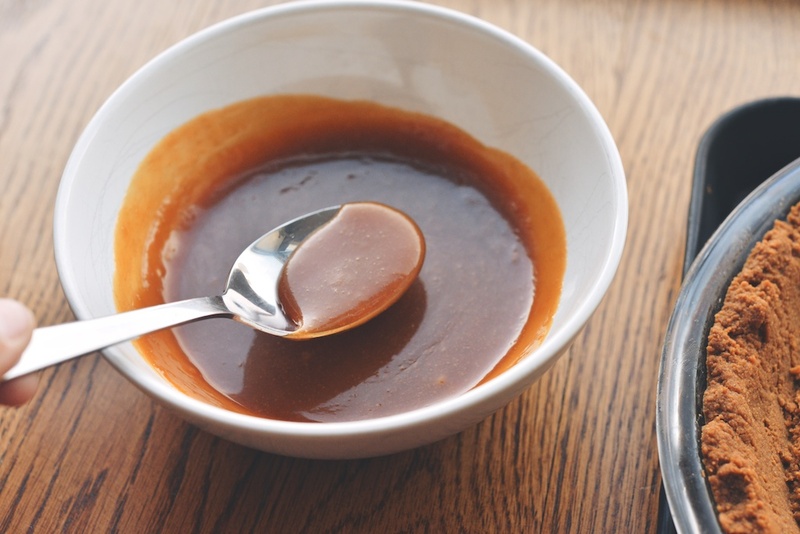 Cook the caramel for another 3-5 minutes, or just until the caramel comes together into a sauce. 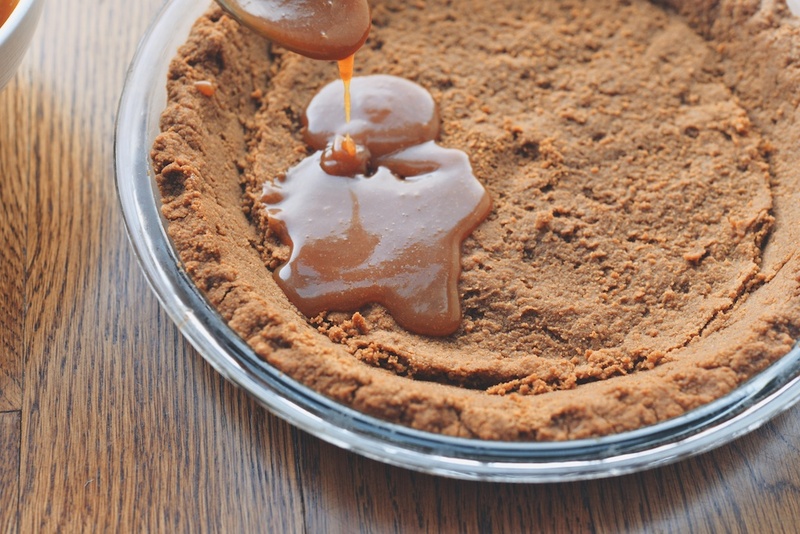 Transfer the caramel to a heat-proof bowl, and allow it to cool. Make the whipped cream: Move the chilled cream to a bowl. (Even better if the bowl is chilled, too.) Using an electric mixer (or a whisk, it will just take longer) on medium speed, whip the cream until its soft, soft peaks form. Fold in the maple syrup. Cover the bowl with plastic wrap, and chill the whipped cream until needed. Toast the hazelnuts: Heat the oven to 350F. Pour the hazelnuts onto a baking sheet. When the oven is warm, move the baking sheet into the oven for 10 minutes. Remove the hazelnuts from the oven, and let them cool until you can easily handle them without burning your fingers. 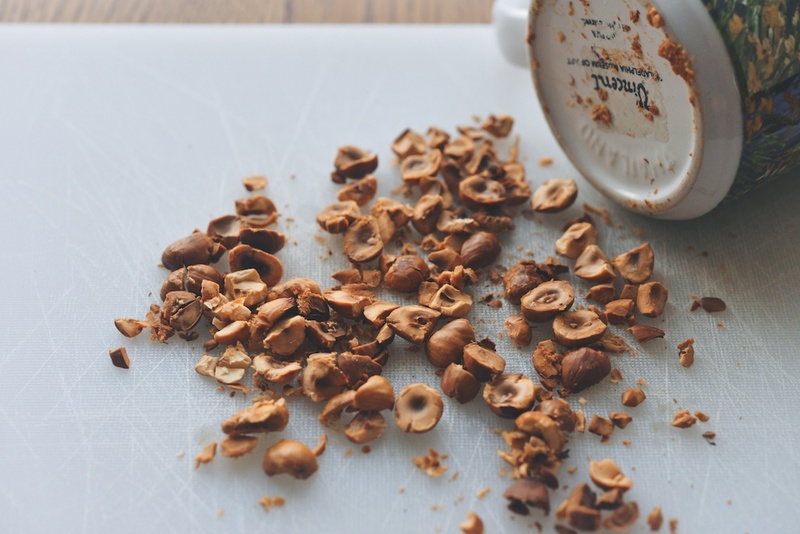 Remove the skins from the hazelnuts; don’t go crazy, if some part of the skins are left on, it’s not the end of the world. Move the hazelnuts to a cutting board, and chop them roughly. (This can be accomplished with a chef’s knife, or by pressing down with the base of a coffee mug.) Set the hazelnuts aside. Prepare the apple cider: In a small pot, reduce the apple cider, the cinnamon, and the nutmeg over medium-low heat for about 20 minutes, or until it is reduced to a thick syrup. Set the pot aside. 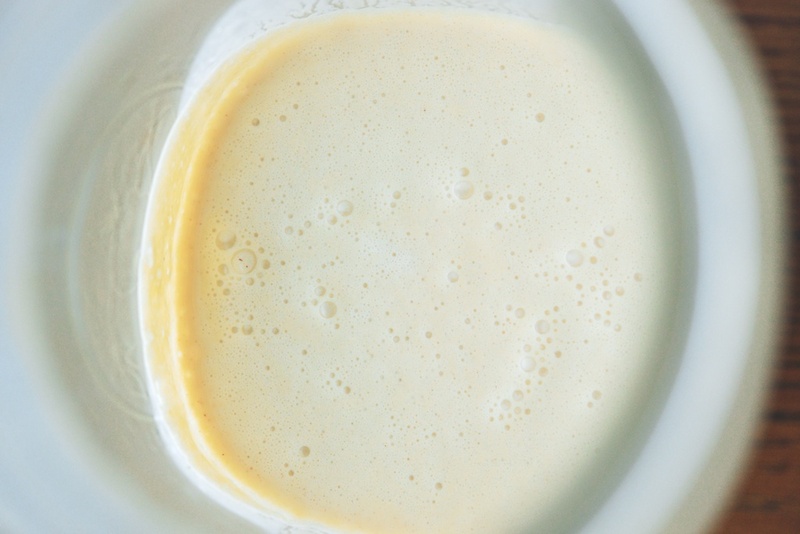 Make the custard: Pour the milk, the cream, 4 tablespoons of the sugar, the salt, and the xanthan gum (if you are using it) into a medium-sized pot; whisk to dissolve the sugar, the salt, and the xanthan gum into the liquid. Turn the heat to medium and, whisking occasionally, allow the milk to foam up in the pot. Once it has, turn off the heat. Meanwhile, collect the egg yolks in a separate, medium-sized bowl. Add the remaining 2 tablespoons of sugar to the yolks, and whisk energetically for 30 seconds, or until the color of the egg yolk lightens. Pour a measure of the milk mixture over the yolks, whisking constantly as you go, so that the yolks do not scramble. Continue to pour and whisk, until the milk and yolks are entirely incorporated. Return the custard to the pot, along with the reduced apple cider; whisk to combine. Turn the heat back on to medium-low, and warm the custard until it is thick enough to coat the back of a spoon. At this point, run the custard through a sieve. Heat the oven to 350F. 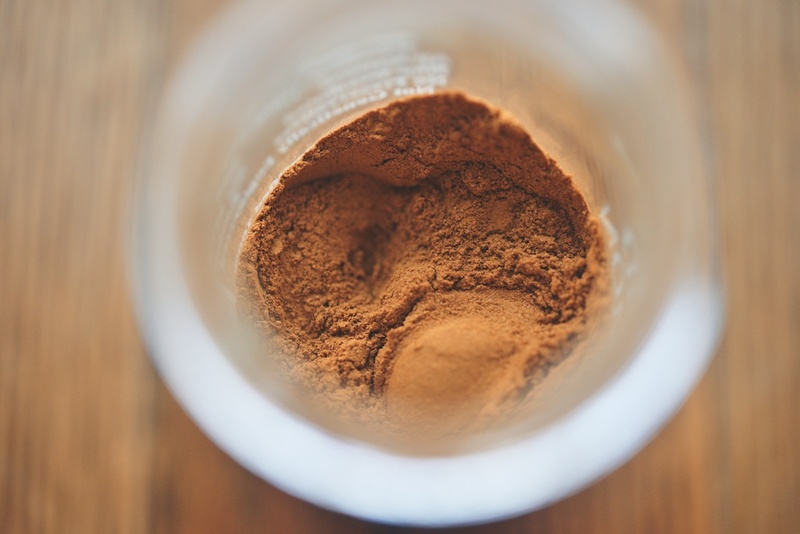 Blitz the graham cracker crumbs in a food processor; weight or measure them out. Move the crumbs, along with all the other ingredients, to a large mixing bowl. Use your fingers to mix everything together, until the crumbs feel like wet sand–it’s fun! Press the crumbs into the pie dish. Move the dish to the oven for 10 minutes. Allow the crust to cool completely. Make the caramel and whipped cream; toast the hazelnuts. 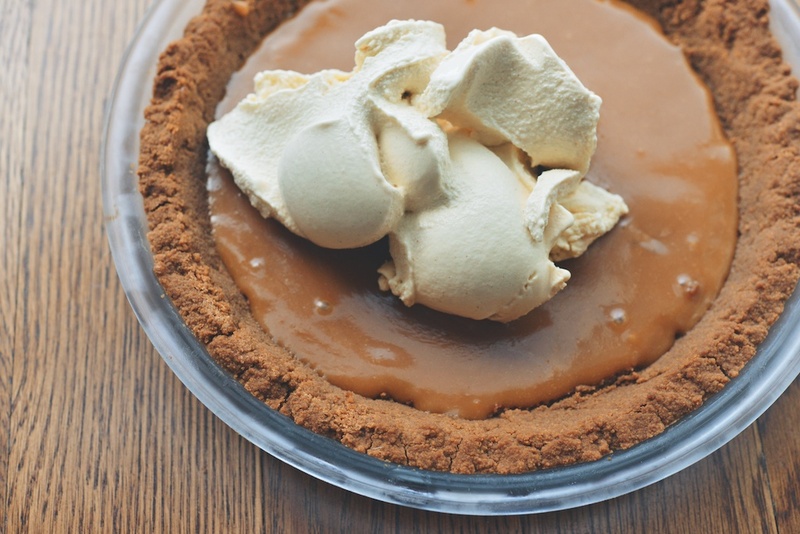 After the graham cracker crust comes out of the oven, allow it to cool completely. Mix your ice cream. Meanwhile, drizzle caramel into the base of the crust (reserve about 2 tablespoons of the caramel); allow it to set in the fridge for 10 minutes or so. When the ice cream has finished processing, pour it over the caramel. Move the pie dish into the freezer for 45 minutes – 1 hour. 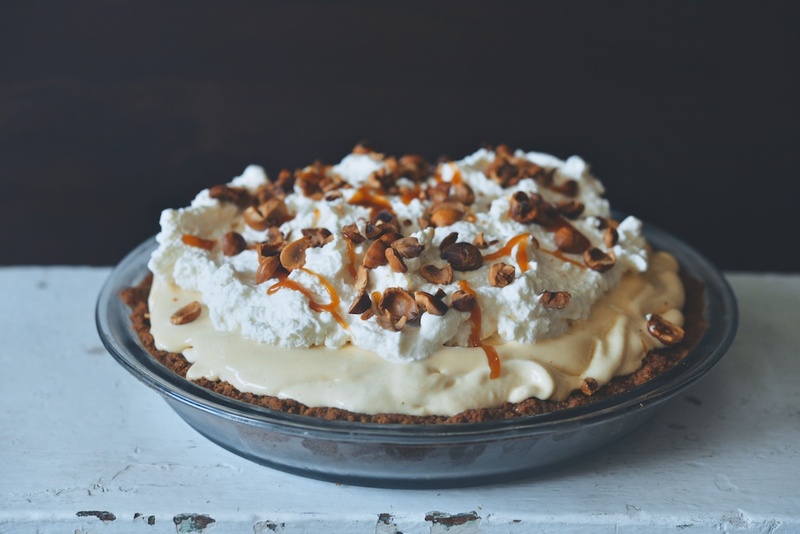 Just before serving, top with the pie with the maple whipped cream, a generous scattering of the toasted, chopped hazelnuts, and the remaining caramel. Serve right away. 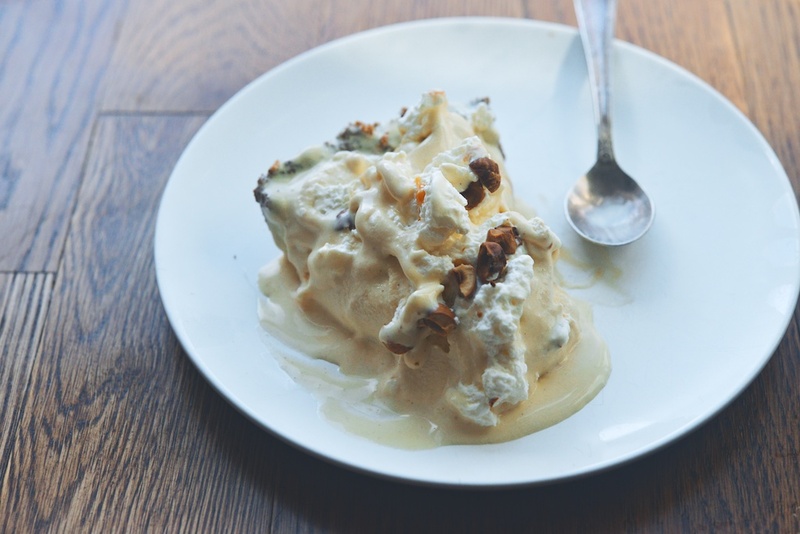 This pie needs to get in my freezer…then in my mouth. Okay, first of all, the sound I just made in the middle of a coffee shop when I saw this recipe was just straight up humiliating. Secondly, I live in Phoenix and the highs are still in the upper 90’s and 100’s and I could seriously kiss you for this fall/summer hybrid. Thirdly, the kitchen insanity cracked me up. I was supposed to make a simple bruschetta last weekend and somehow it turned into a day long project that involved so much roasting and chopping that I seriously debated skipping the party and going straight to bed. In summation: bookmarking this post right now. Ha, I love everything about this comment!